Nobody relishes the prospect of losing their possessions, especially to thieves. For vendors of physical products, ensuring that a client’s cargo reaches its destination in one piece can cause a headache. Read on to get tips on how to securely track your shipment. Majority of the theft cases involving shipments occur when the ferrying truck is stationary. Often, the criminals target unattended vehicles that are parked on the roadside, filling stations, and designated parking areas. 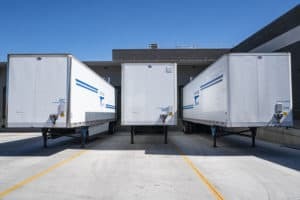 Though rare, there are a few cases were theft occurs in transit, either through robbery or by the thieves sneaking into the trailer without the driver’s knowledge. If you are a vendor, below are ways through which you can improve the security of your consignment. Technology can work to your advantage in increasing the security of your goods during shipping. For instance, you can fit tracking devices either on the truck or the goods. This enables you to monitor the progress of the shipment as it moves towards its destination. Modern trackers have geo-fencing features that will notify you if the cargo moves in an undesired direction. Additionally, you can also use identity verification to ensure that only authorized people have access to the cargo. Netverify was built to meet the needs of leading global brands looking to implement cutting-edge ID verification solutions. This solution can easily integrate with a webcam placed inside the ferrying vehicle, allowing you to track the package securely. As mentioned above, thieves are always on the lookout for unattended cargo trucks. This means that you should always leave somebody with the vehicle to keep the criminals away. Also, you should ensure that your vehicle is always parked in a well-lit area. This is because sufficient lighting discourages thieves. Well-lit areas are also more likely to have security cameras, making it is easier to spot suspicious activities. The simplest way of avoiding being a target of theft is concealing information about your cargo from unauthorized people. This information includes the nature of the cargo, its destination, and the route the shipping truck will use. If a would-be thief doesn’t know what you are shipping, their likelihood of targeting you decreases significantly. Likewise, if they don’t know your route, they won’t know where to stage the attack. Before embarking on any trip, you should make a habit of inspecting the condition of the cargo. This should also apply when you a restarting a journey after a short break. Constantly checking the shipment reassures you of its security as well as its condition. A routine checkup should look at the condition of the container seal and locking mechanism to establish whether they have been tampered with. It might be impossible to entirely keep off thieves, but following the tips mentioned above reduces your vulnerability to theft. With better security, you are certainly assured of retaining and growing your client base.